In order to create an up, or ascending, channel, just draw a line parallel to the uptrend line, and position it where it touches the most recent peak. This should be done at the same time as you draw the trend line. 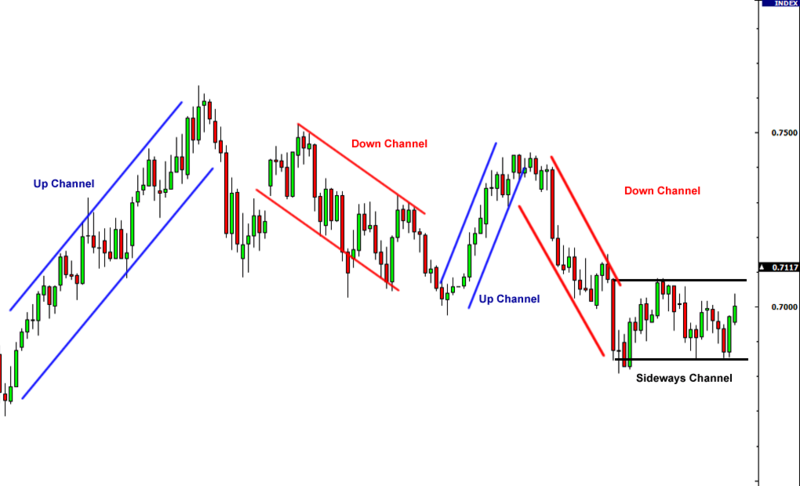 In order to create a down, or descending, channel, draw a line parallel to the downtrend line and position it so that it touches the most recent valley. Once you have established a trend, you can use the point at which the price hits the lower trend line as a cue to buy, and the point at which it hits the upper trend line as a cue to sell. Horizontal channel – a succession of equivalent peaks and troughs. It is important to remember to keep the lines parallel when constructing a channel. As with trend lines, if you have to force the channels to fit, then they are not valid channels, and are therefore less likely to provide you with reliable buy and sell cues.